I am a painter, in oils and watercolours, a sculptor in cardboard and plaster and junk, and a sometimes singing live artist delivering a variety of performance pieces including "Vox Wonder, Voice Activated Drawing Machine", "Sweetalking" and "Moon Moon Sing Sing". My live art practice connects through my other work - for example in 2017 I delivered the singing piece "Full Fathom Five" at Cafe Gallery Projects, with the painting "HMS Impregnable" and I often deliver the art performance piece "Cake Smash", which involves the building of a plaster junk bling boudieware decorative cake sculpture which is then deconstructed, or smashed up, while I deliver a medley of songs with an environmental theme. The pieces of smashed sculpture are then gifted to the audience who are invited to create an installation with them. Painting is my life, and the most important strand of my practice. Since leaving college in 1991 I have developed a well established socially engaged practice. I have many years' experience of working as a freelance artist both solo and in collaboration with other artists and with public bodies, galleries and institutions. These include The Ikon Gallery, The Royal Parks at Richmond and Kew Gardens, The National Trust, Fashion and Textile Museum and The Royal Academy. I specialise in residencies, running creative art workshops and devising and delivering live art interactions, as well as exhibiting my artwork. I have a studio space in South East London. I started painting in oils at the age of eleven and have been drawing all my life. I later began to experiment with different media from taxidermy and embroidery to live art. 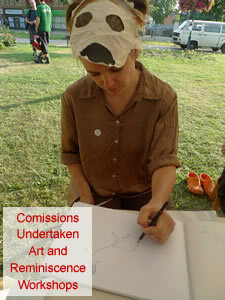 My artworks, installations and live art interactions explore humour and human relations, emotions and engagement. They build a space for people of all ages to connect with creative play. My artworks experiment with the boundaries and uses of drawing and painting. I am inspired by my work with children and older people and museum collections. My themes are rich and varied, including memory, music, literature, history, reminiscence, surrealism, naivism, nostalgia, colour theory, nature and overall the sea. I teach art to adults for various bodies including SALS and The Union Chapel in Islington, and I deliver my "Bespoke Commission Project" to businesses and offices throughout London.